AGRIDrench Niacin for a perfect start of lactation after calving. Prevents energy deficiency after calving. Lowers the risk of ketosis. Contains propylene glycol as a starting energy. Contains vitamin B-complex to increase appetite. Ensures a healthy start of lactation. Rapid absorption trough the “Drench”-Method. Approximately 3 to 4 weeks after calving the cow again reaches the maximum milk production, however, the maximum feed intake is achieved after 6 to 9 weeks. Precisely in these weeks of lactation it may cause problems in the metabolism; a situation called a negative energy balance. The cow is now trying to compensate for this nutritional gap by reducing the body's own reserves. Especially high yielding cows, which are in a negative energy balance, tend to develop ketosis (metabolic disorder). What are the possible consequences of ketosis? Reduced feed intake, weight loss, fatty liver, fertility problems, retained placenta, increased risk to a displaced abomasum, hoof diseases, degradation of performance, high treatment costs and in many cases loss of dairy. How do I recognize a ketosis? incoordination, nervous behaviour or by examinate blood, urine or milk. Achieve optimal body condition at drying off (BCS from 3,25 to 3,75). Drenche energy drinks (AGRIDrench Niacin) after calving. AGRIDrench Niacin is an energy drink that contains both niacin and propylene glycol as well as a vitamin B complex. Precisely this vitamin B complex ensures the stimulation of appetite and thus boosts its own metabolism. If required, the application can be repeated. CAUTION: Please ensure that there is a swallowing reflex! 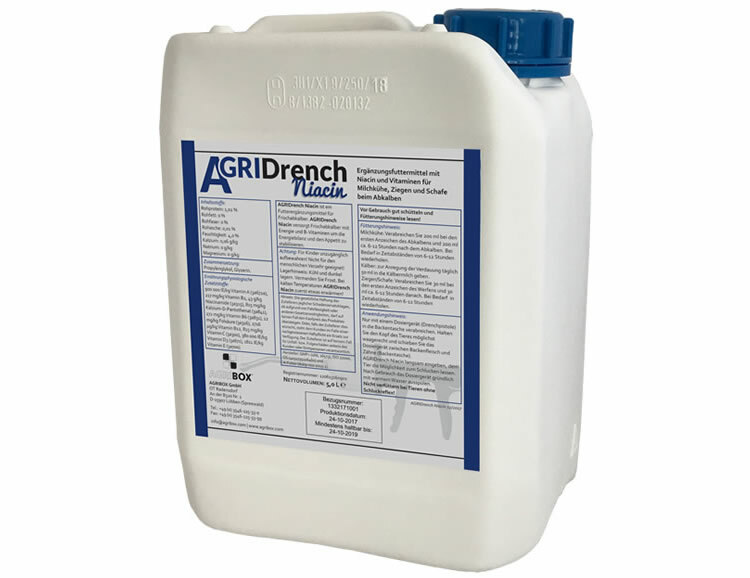 AGRIDrench Niacin is available in 5 liter containers. With the drench method the drenchgun is inserted between the cheeks and the molar teeth into the so-called oral vestibule. This way the solution (AGRIDrench Calcium, AGRIDrench Niacin or CCDrench™) directly flows behind the tongue into the esophagus so the cow cannot taste it. This ensures a stress-free and easy administration of forage supplements to animals. No irritation caused by the taste. No risk for the solution to flow into the lungs. SUGGESTION: before inserting the gun into the cow's mouth, warm up the copper tube in warm water in order to not scare or irritate the cow!